Looking back always provides perspective. A year ago, I was worried about finding balance. I had a newborn at home, and I didn’t know how I was going to make time for everything that was important in my life. The year was one of challenges, re-prioritization, steep learning and immense joy. It wasn’t always easy, but I believe I’ve again found that balance. Our little one is a toddler, and we’re enjoying the challenges that parenting provides. I’m perhaps most excited about fostering a love of the outdoors in her. My approach to photography has inevitably changed this year. Photography was always something I could do at my leisure, but the concept of leisure simply cannot be the same any more. Sneaking out for sunrise was always easy, but now it must be intensively coordinated. Overnights, even harder. While I’ve had less time in the field this year then ever, I’ve grown significantly in my ability to anticipate and previsualize, and I’ve fortunate that luck found me as well. Because of this, I’ve come away with images that I’m incredibly proud of. 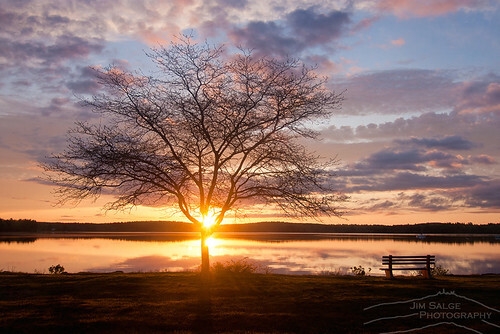 Shots that capture the very best of of New Hampshire’s light and landscape; magical moments that I continue to be fortunate to witness, and am glad to be able to share with all of you. On the coldest morning of the year, fellow photographer Jeff Sinon and I called a meetup on Facebook at Newcastle Common. 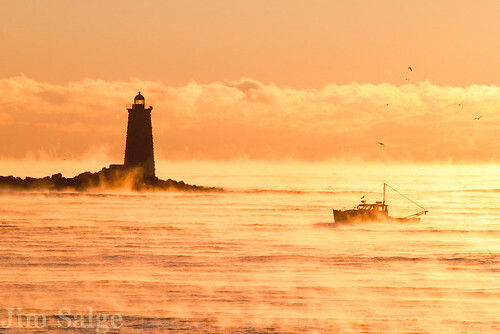 It was about -9F at sunrise, and over two dozen people joined us in one of the most spectacular displays of nature…seasmoke at dawn. A sincere thank you to all those who follow my work for the praise, encouragement and support throughout the year. It’s a privilege to be able to bring these views to you. I drive by this barn regularly, and had wanted a shot like this for years. It just took the right conditions. 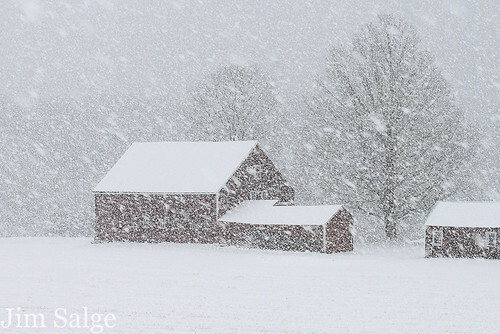 This snow squall was short lived and intense, and the atmosphere it created epitomizes winter in New England to me! A tip of the hat to fellow photographer John Vose for letting me know about this bird, out of the way of the main rush that was the scene surrounding snowy owls in 2014. 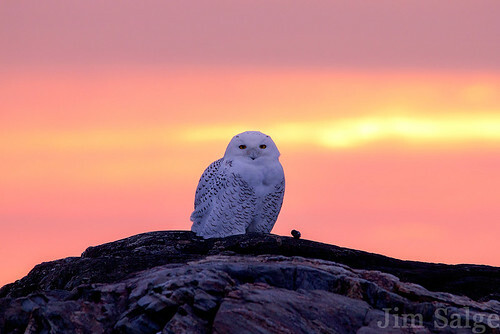 We had a quiet moment photographing this bird at dawn…certainly one of the more special sunrises I’ve ever photographed. I pass this scene every morning on the way into work, but rarely can stop at sunrise. 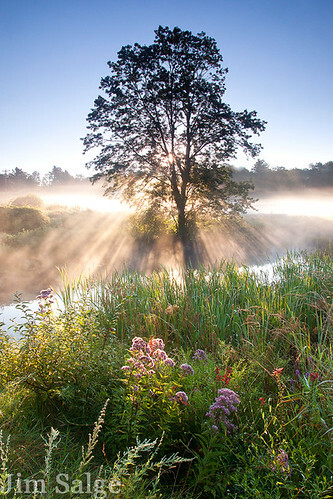 In April, the sun rises early enough to make it in after moments like this. 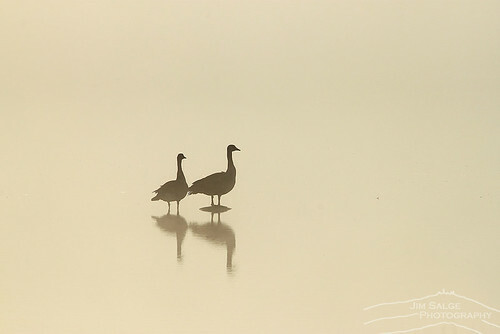 Dense Fog at Pondicherry NWR created a surreal scene at sunrise, where these two geese standing in shallow water were completely isolated in a world which had no sky, no foreground, no up nor down. A truly great morning, until the bugs awoke as well! I battled myself about whether this sunset would happen, and if I should focus on waterfalls under the cloudy skies. In the end, I gambled, and was treated to one of my favorite sunsets of the year from this iconic location! 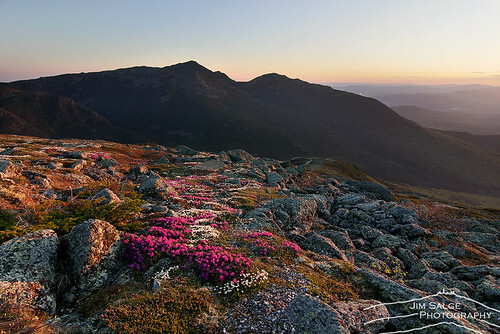 The alpine zone in the Presidential Range is one of the most unique environments in the state. While it looks desolate, lifeless and barren most of the year, it erupts into bloom briefly every summer, providing the most improbable display of beauty. This scene is one I treat with most respect, never straying from the rocks for fear of crushing these fragile alpine refugees. 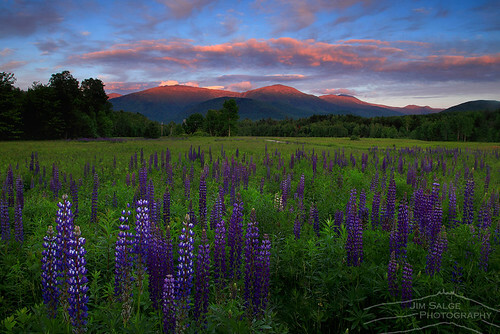 This was a generally down year for lupines in New Hampshire, but there were some beautiful patches to be found. 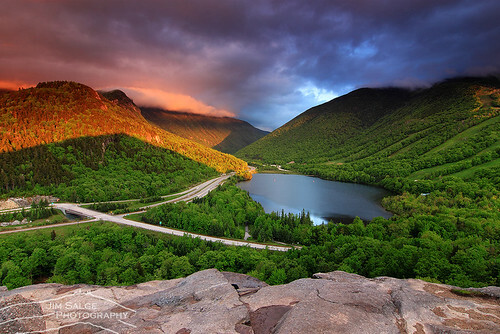 I photographed this amazing sunset with fellow photographer Adam Woodworth. 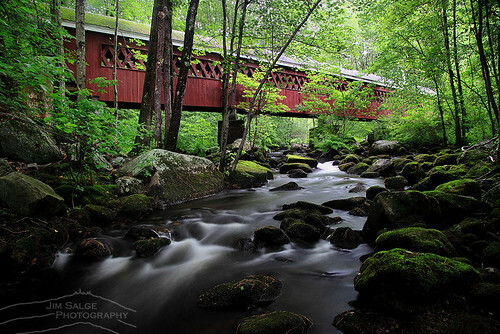 I spent an amazing morning after a rainstorm capturing the swollen streams of southern New Hampshire, and found perfect conditions at this iconic New England scene. 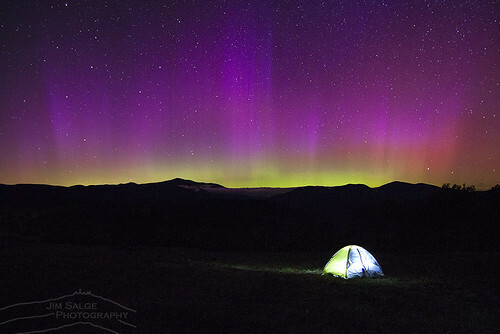 A much anticipated solar event found me ready to spend the night at this vantage overlooking Mount Washington. A crowd gathered right after sunset for what turned out to be an incredibly short lived, intense and amazing show. My first photographic trip to the far northern portion of the state didn’t disappoint, and only leaves me dreaming of further possibilities next summer! The grand view at the shoreline is one of the best in the state, but I was entranced the partially obscured view through the birches along the path leading to the vantage. 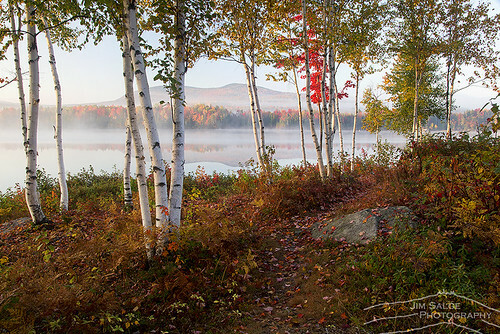 This shot captures everything I love about autumn in New England! 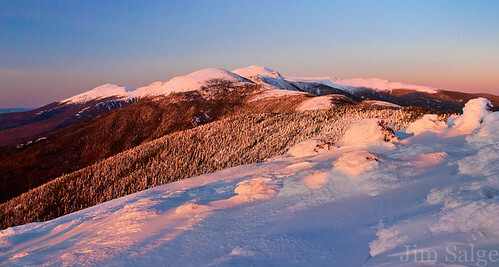 A vantage I’ve long dreamed of photographing, an isolated vantage from a peak with no trail to it, and an iconic view of Mount Washington. A huge tip of the hat to Chris Whiton for guiding me there that night! Sunrise after sticky snow is always beautiful, even if it was one of the most disruptive storms in recent memory. No power and a full house for Thanksgiving…a great time to reflect on what’s important! The flipping of the calendar offers a symbolic fresh start, and a chance to refocus and prioritize. Finding balance with new priorities has been the major theme of 2013 for myself and my photography, and it will continue to be in the year ahead. This past year, my wife and I welcomed our first child, Evelyn into the world, and this has meant tremendous changes in all aspects of my life, and has definitely forced a change to my style of photography. Time and priorities have allowed fewer long hikes and overnights outings, and getting out early has often been challenging as well. 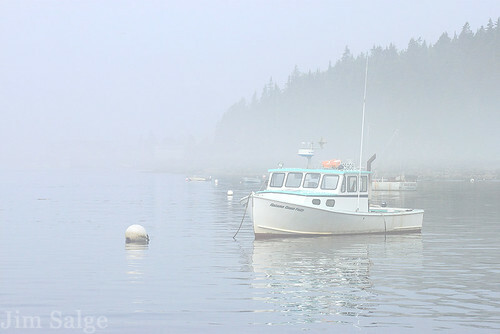 In response, I’ve looked to smaller scenes, local scenes, and the traditional New England rural landscape. In some case, the experiment has worked, and has allowed me to experiment within the discipline to capture some great scenes this past year. At times though, I’ve felt that the new style has been derivative and uninspired, and focused too much on visiting iconic locations and trying to make something that is not my own work for me. For the first time, photography sometimes felt frustrating, and a bit pressured. To overcome this, I need to get back to being true to what inspires me, and focus on enjoying my time spent outdoors, letting the photos come to me. Ultimately, I know that I’ll return to my style…broad landscapes captured in dramatic light and atmosphere. I will, in time be able to return to the mountains that I love with more regularity and consistency, and will be able to introduce my daughter to them too. In the mean time, I’ll have to look to be creative, be patient, and take advantage off all the opportunities that I can, while making sure that I find balance with all the other important factors that my life has been blessed with. Warm weather over a cold snowpack always means ground fog. 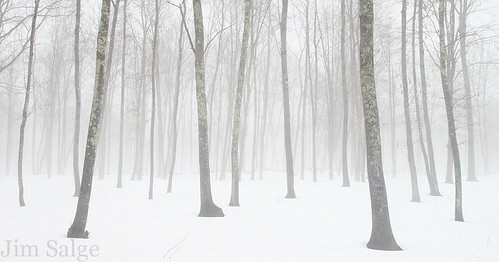 Conditions like these are perfect for shooting simple, graphic shots like this one in the open woods. 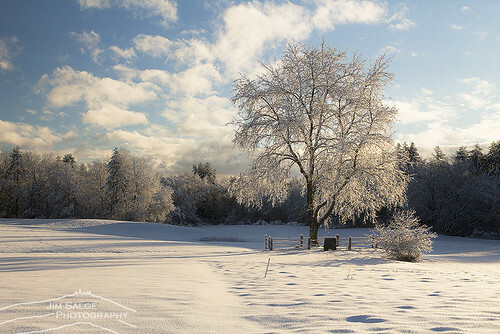 I have worked on a list of locations to shoot nearby this year should these conditions arise again! Sticky snow only hangs in the trees a short time, but I was fortunate to catch it against the red bridge. An iconic scene that I’ve tried for years to make my own. 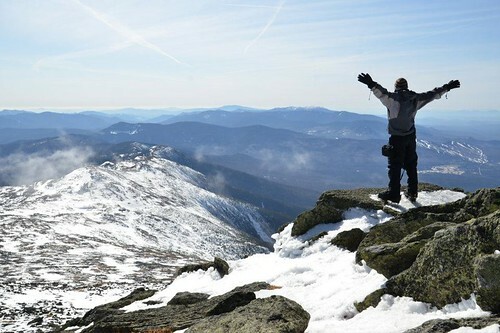 One of my few hikes to a mountain summit this past year, and I picked the perfect day to do it. Temperatures just below freezing, no wind, and bright sun made the forest look magical on the way up, and the peaks glow at sunset. 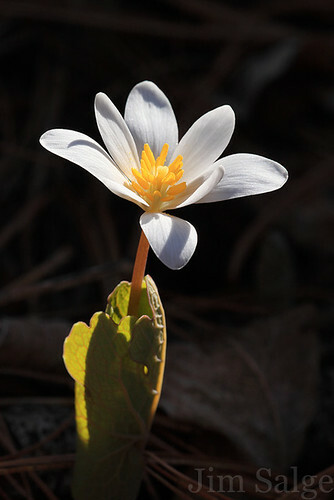 Bloodroot is my favorite early ephemeral flower, as it is large, showy and stands out against the otherwise bare ground of late March and early April. 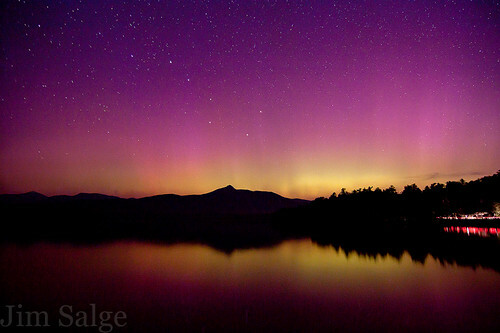 I found this grouping in Rumney, NH and spent a good deal of time fine tuning this compelling shot. 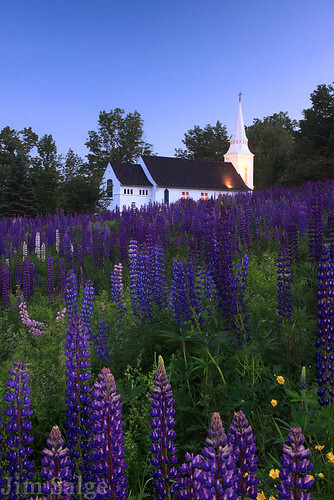 Every year, after capturing sunset in the beautiful town of Sugar Hill during their June lupine festival, I find myself drawn to this church, trying to perfect a composition I’ve long been working on. This one finally really works for me! 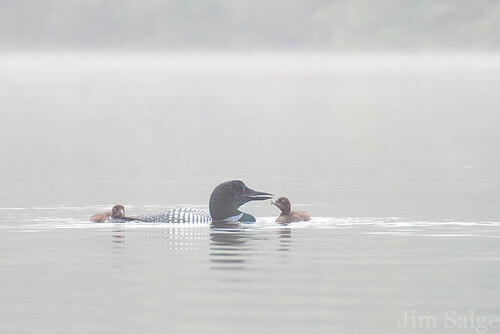 The past few years, I’ve been drawn to the lakes in July to watch the beautiful connection that loon families have when raising their young. When photographing them, I’m really trying to capture their interplay, and this shot captures everything that I love about young loons! A local scene, less than five miles from my house, captured right after Evelyn was born. It represents balance to me, both in the frame, and in my new life. My favorite summer flowers, Joe Pye Weed, Cardinal Flower and Goldenrod are all in the frame below the tree. While walking along the local trails at Lake Massabesic I came upon a pond nearly completely filled with lily pads. 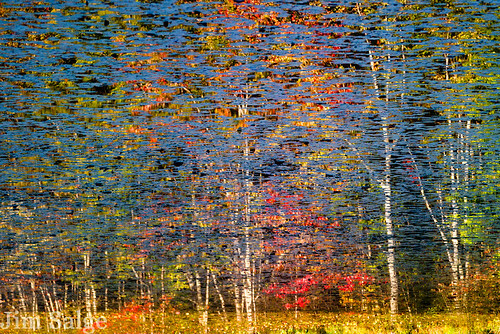 The reflection of the swamp maples on the far side in the early morning sun made the most interesting frame for me this year. I blocked the Columbus Day weekend out this year as a time to get away and capture some fall images, but the weather did not cooperated. Gray and dreary weather dominated the weekend, forcing me to look at smaller scenes. 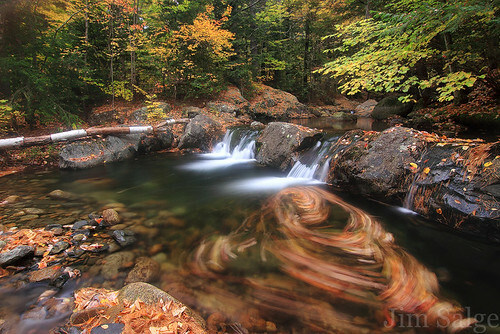 This stream in the Ossipee Mountains allowed for some creative shutter work. 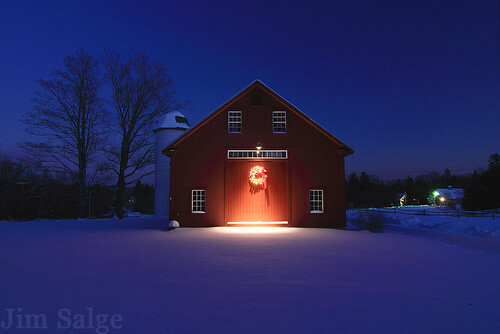 A local barn that has been drawing significant attention over the past few years by local photographers. I tried to do something different with it, and after driving by and seeing the wreath, I knew a blue hour shot would bring some originality to it. Professionally this year, photography was very good to me. I was fortunate to go on assignment for nearly a week aboard a Maine Windjammer and capture a part of New England I’d never seen. This image represents the working side of my photography, one which I am always striving to expand. Ten plus one of my favorite images this year. The celebration of the New Year is an arbitrary event in the grand scheme, but one that has taken on great cultural importance as a moment of pause, reflection and revision. We can bid farewell, or perhaps good riddance to 2012, and welcome 2013 with new hopes, dreams and visions. 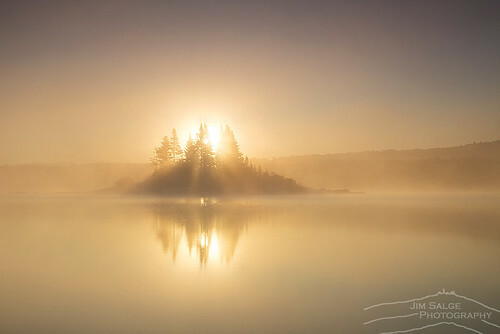 In the review of my photography from this past year to put together this ‘Top Ten Blog,’ I began to realize that my favorite images from the past year were also some of the most peaceful, quiet and serene moments that I personally experienced. Twenty twelve was a chaotic year, with disasters and tragedy that hit far too close to home, and my time spent ‘working’ on my photography provided a opportunity for balance, contemplation and perhaps temporary escape. It’s my sincere hope that some of the peace and serenity that I felt while capturing these images is conveyed to you when viewing my images. After shooting sunrise from an overlook a few miles away, I moved down to the river, where mist was rising thick that morning. 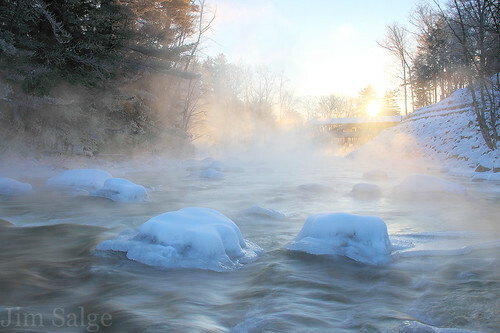 Temperatures hovered in the negative single digits, but the sun adds a warm glow to this otherwise cold scene. 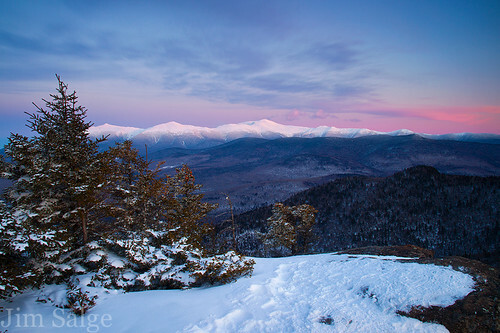 I was initially disappointed that my second sunset hike up to Owls Head in less than a month ended without alpenglow on the distant ranges, but the light after sunset really lit up the sky above the Presidential Range. This remains one of my favorite views of the western slopes of Washington. I had set up my camera to capture a panorama from Bethlehem, NH, but the light never came. 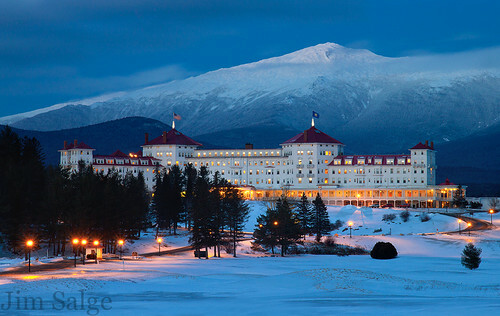 This vantage from Bretton Woods was plan ‘B’ for the evening, but turned out to be the far best option, and some great conditions during blue hour! I grow less and less fond of the summer heat every year, and have put aside my love of hiking for some time in the kayak the past few summers. The loons in New England have been having decreasing success fledging chicks, but this family was successful this year with BOTH! 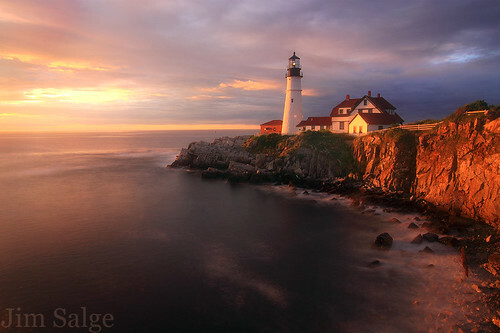 The forecast for a departing storm, high tide and large waves drew me to this New England iconic location in late June. The sun rises far enough north on the horizon to light up ‘the other side’ of the view from the classic shots here…and I really liked hot the sun lit up the cliff face! 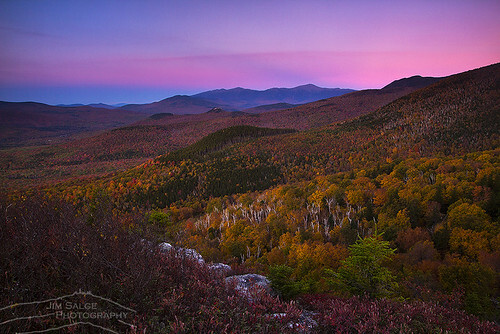 A light snowfall coated the highest peaks of the White Mountains, while peak foliage blazed below. I used to live at the other end of this road, and had long dreamed of conditions like this…I was thrilled that they all came together this morning. I’ve learned that Christmas Lights look their best both when it’s snowing, and during blue hour, which is a misnomer, as the blue light really only lasts for about 20 minutes. 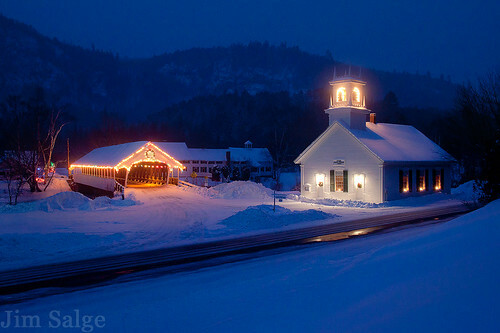 Nonetheless, everything came together for me a few days ago at one of the most quintessential New England villages. Capturing this made the 250 mile round trip in the storm more than worth it! Thanks for following along with me this year, and I’m very much looking forward to new work and new experiences in twenty thirteen! I was afraid that I was going to again strike out this year. 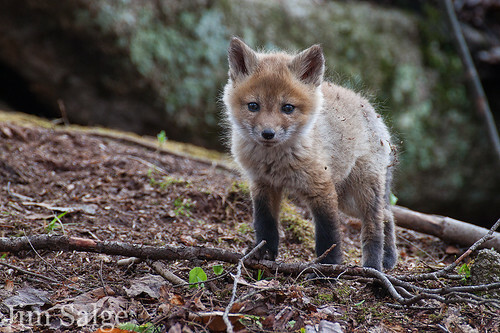 It’s been a few years since I’ve had the chance to photograph a fox den, and I was having a terrible time finding one this year. Fortunately, my social network came through, and a fellow photographer Matt Hoffman keyed me into an active den in his neck of the woods…and I was off! I found the den rather easily, as the kits were out sunning themselves on a big rock when I got there. The parents were nowhere to be seen, presumably out hunting for their brood of five. First order of business…allow the kits to be comfortable with my presence. This involves a lot of sitting, and yes, talking to them. The animals clearly knew I was there, so I always figure talking can help break the ice. After about an hour, I had slowly worked my way towards a clear shot of the den. I only moved in close enough for my 300mm lens to get some environmental portraits, and then lay on the ground considering the light and getting a few shots as they quietly played. Mom came back, and everyone scrambled to the far side of the rock from where I was. I assume in the time she was there, about five minutes, she was nursing, as I briefly saw her nursing upon her second return. When the kits failed to return to the den, I went out to the road, and found them all playing roadside on the rocks in the bright sunshine. They were good about avoiding the road…never venturing upon it, and hiding every time a car came. During this time, I began to see that each of them had their own personalities…some brave and adventurous, some timid, one mischievous. Quite the social dynamic…even forming individual bands of two and three respectively. 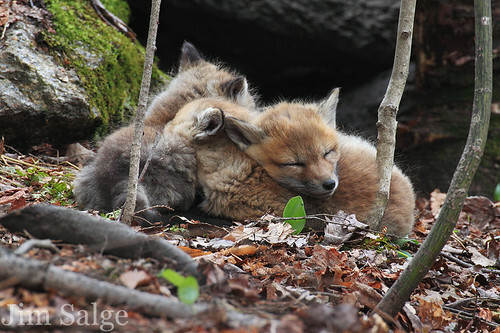 Pile of Fox Kits ... Fast Asleep! When mom came back again, everything stirred suddenly, including the surrounding forest. Rodents and birds sounded their alarm calls. 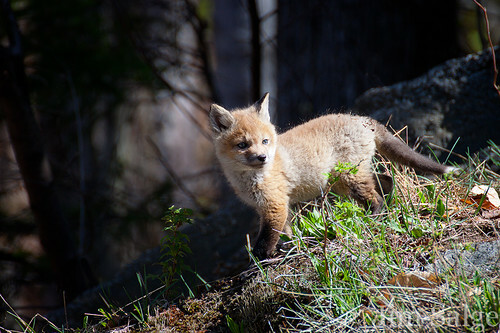 One of the kits, so excited to see mom, and forgetting that I was there, ran right at me. I initially froze, but I didn’t want the kit that close, and I knew that mom was behind me somewhere (subconscious fear of attack?). So I motioned for the kit to stop. 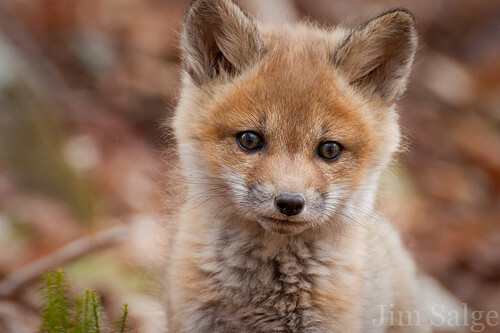 And it did, and I managed this one shot of a way to close fox kit. I wish I didn’t chop the ear, but it happened way to fast. Mom's Back ... Accidental Extreme Closeup! Mom didn’t stick around long again, likely not wanting to feed with me there, but the kits were active again. They mainly stayed in the forest area, which now had a nice even light as clouds had filled in. I struggled to keep the shutter speed high enough for their motion, but got a few more nice shots as they played and rolled around. When mom came back again, I knew I’d likely overstayed my welcome, and slunk away for the day. 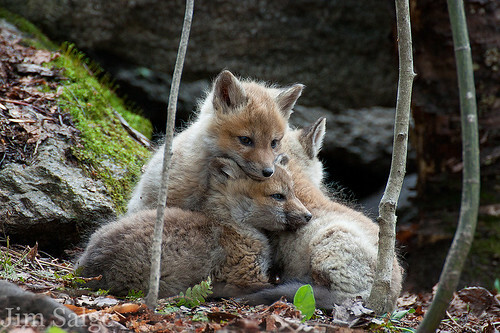 I had spent over five hours sitting quietly with a family of foxes, observing, learning, and capturing the scene as best I could. Couldn’t have imagined the day going any better! Record heat in late March pushed the wildflowers out of the ground VERY early, and caused the trees to bud out way ahead of schedule. 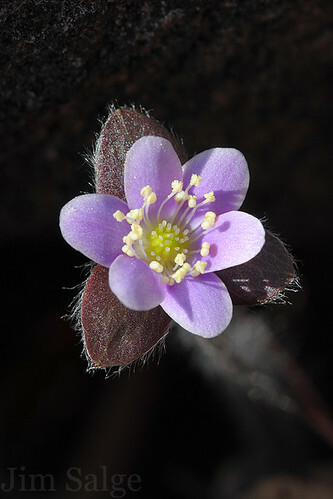 By April first, I had photographed Bloodroot, Hepatica, Spring Beauty and Arbutis, all well ahead of their historical norms. Unfortunately for the plants and trees, as quickly as the heat came in, it left, and normal weather this time of year in New England means below freezing temperatures. Growth of leaves ground to a halt, and my garden has some serious frost damage. The forest floor responded in suit by slowing the progress of flowers, and we’re stuck in limbo. It had been dry as well, which has lead to low stream and waterfall flow, and on windy (most) days…brush fires. All this has made it tough to get out and shoot, and I don’t feel like I’m missing much out there! Until then, I’m not expecting much in the way of photography until Late April. See you then! Well, we just endured one of the warmest March weeks in New England since records began to be kept. Ice is out on most major lakes, and for many it was the earliest ever. Migrating birds have begun to return, and a spring chorus wakes me in the morning, with cardinals, phoebes and robins leading the way. In the evening, it resumes, completed with spring peepers, wood frogs and woodcocks. All this is well ahead of the normal schedule. 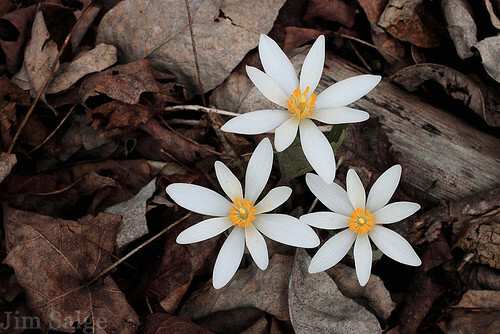 My favorite thing about spring is always the wildflowers that race to bloom in the forests before the canopy leafs out. The cues to start heading to the woods are the crocuses blooming, and by last weekend, they were out enjoying the first days of the warm stretch. It just kept getting warmer through the week though, and though I couldn’t get out to my Hepatica covered hillside until Friday, the bloom cycle wouldn’t wait. By midweek, the maples had popped and daffodils arrived, and by friday, the magnolia trees had started to open up. All this is WAY ahead of last year. As I drove into the back entrance of Pawtuckaway on Friday, a patch of Colt’s foot was blooming along the road. I found the hillside covered in sporadic flowers, but the full bloom hadn’t yet arrived. Which is probably a good thing for the flowers, as they are blooming 20 days earlier than last year, and 11 days earlier than I’d ever found them in this location. Will spring continue to race ahead…likely not, which has me concerned. Two years ago, the fruit trees bloomed early, and a late frost killed the apple crop for the year. But humans aren’t the only species that takes advantage of the fruits and flowers. Early blooms can happen before migrations that have long been in sync. Birds and butterflies may be pinched out of a usual food source, leading to a failed breeding year. And cold weather is forecast, with temperatures in the twenties forecaster for lows early this coming weeks…which is of course…normal! How will the rest of this spring wildflower season play out…we’ll have to wait and see…but I do know my expectations are not likely to match my experiences! 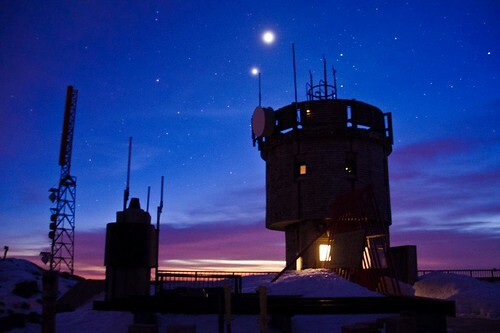 If I could pinpoint a moment that I decided to take photography more seriously than just as a hobby was one beautiful June night, while working at the Mount Washington Observatory as an intern. The northern lights were putting on a show, and the night observer and I were trying to figure out how best to capture them, and I realized how much science there was in this form of art. This week, I was given an opportunity to share how much I’ve grown since that night, and share it back at the place that was so formative of my passion. 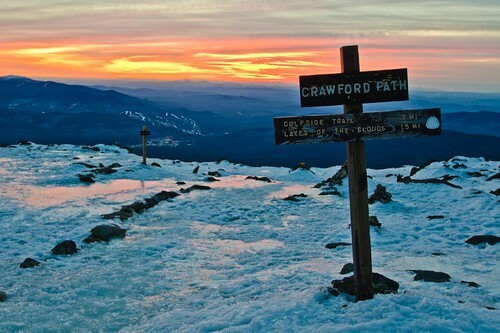 I was asked to lead an Edutrip in conjunction with the Mount Washington Observatory, a non profit organization dedicated to Observing the weather and educating the public about the arctic island in the sky that they are perched upon. This trip was about the growth of the participants on the trip, so I’ll share a few of the pictures captured by Tracey Streeto, who has been honing her photography for just a few years now, and has been getting great results. We arrived at the summit to record warmth, a far cry from my failed trip last year, and immediately went for a walk around the summit, taking pictures of each other in grand scenes. During the afternoon, scouting the sunset is important, as making sure you are in the best place, in the best light at sunset takes a bit of work and exploring before the light arrives. After some class time, and a wonderful wine and cheese hour, we set out to revisit our favorite sunset compositions. The sky turned a glorious shade of pink, which reflected off the icy snowscape in the foreground, and everyone was treated to a unparalleled show from the highest peak. Nightfall brought the best opportunities of the trip though, as the alignment of Venus and Jupiter set up right over the tower from the deck. I was transported right back to that first night when I became interested in photography. As I reflected…everyone else was experiencing their own formative moment. Such an enriching night…and a wonderful trip!